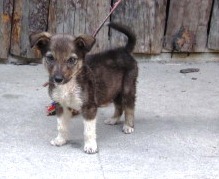 Little Lucho was found crying and wandering the streets alone at the beginning of Panajachel’s annual fair. It’s a big time in town with lots of activities, extra people and loud fireworks. Poor little guy was terrified! A local restaurant owner and Ayuda volunteer took pity on him and provided Lucho with a foster home while the rest of us put out the word that this pup needed a permanent home. Yesterday Lucho was picked up by his new “daddy”, Agosto. 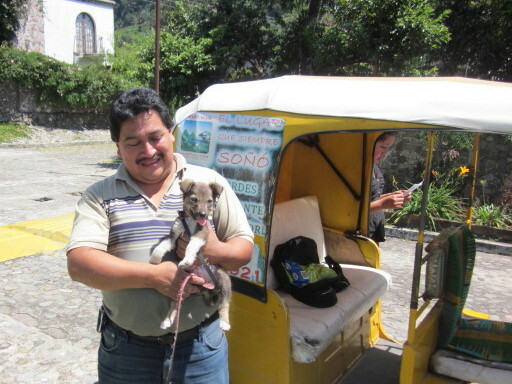 He will be living in a family home in Jucanya and getting around in style as Agosto is a local tuk-tuk driver. Best wishes to Lucho and his new pack!